Chayote is bland, you say. Tasteless. Pointless. A little weird. I’ll concede some of that. 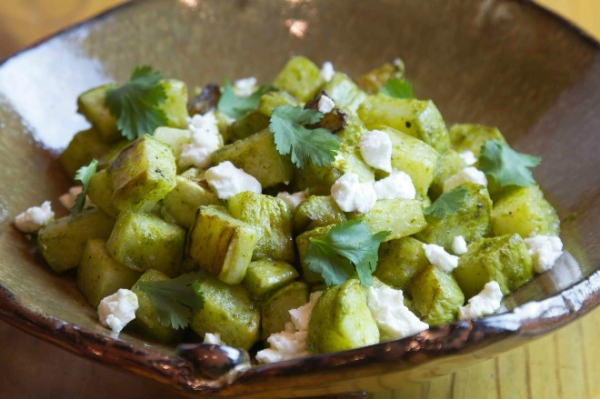 But have you ever tried chayote that’s been high-heat roasted? Changes everything. The heat concentrates all of chayote’s light flavor and juicy texture, bringing out attributes we’ll underscore here with an herby, spicy green adobo and a spark of lime juice. Add some fresh goat cheese and spoon it all onto a warm tortilla, and you have a flavor-packed taco filling that skews toward the lighter side. Quick note: the jar of adobo you’ll make will last for months in the refrigerator, and you can use it on everything from scrambled eggs to salad dressing. Oh, and pasta. It’s great on pasta. Toss the chayote with the olive oil and a generous amount of salt (usually about ½ teaspoon) and cracked pepper (usually about ¼ teaspoon). Spread it onto a rimmed baking sheet, slide it into the oven and roast, turning every few minutes, until the chayote is beautifully browned and tender, about 25 minutes. Remove from the oven and toss with lime juice, lime zest, and 3 tablespoons of the Green Chile Adobo. Divide between four warm serving plates and gently fold the tofu into the chayote with a spoon (if you’re using cheese, scatter it on top). If you have any leftover parsley or cilantro, sprinkle some on each plate and you’re ready to eat. This makes a perfect taco filling (especially layered with black bean refritos); served over greens such as baby arugula or watercress, it becomes a robust salad.